If you're heading to the Pushkar Camel Fair, finding somewhere decent to stay on a budget can be challenging as hotels in Pushkar raise their rates substantially during the fair. Many people end up staying in luxury tented camps set up in the desert especially for the fair. However, these are costly and you will be isolated. The fairground is located to the west of town, near the intersection of Brahma Temple Road and National Highway 89. Ideally, you'll want to choose a hotel around this area to be close to the action. It's possible to arrive a couple of days before the fair starts and find somewhere suitable. However, if you want to book in advance, the following budget hotels and guesthouses are popular and near the fairground. Hotel Moonlight is owned by two brothers and has 10 spacious rooms, traditionally decorated with colorful Rajasthani paintings and handicrafts. Half the rooms have private balconies, while the other half overlook the fairground. All have attached bathrooms and hot water. There's also a rooftop terrace where delicious food is served. Expect to pay 2,100 rupees per night, plus tax, upwards during the camel fair. (Normal rates start from 400 rupees per night). It's great value, and most importantly cheerful, clean and comfortable. Hotel Everest is a budget traveler's favorite! It's rare to hear anything negative said about it. Rooftop restaurant with fresh food and superb views, friendly staff, clean rooms, and brightly painted interiors all make it stand out from the rest. The hotel is conveniently located around halfway between the fairground and the main bazaar. Rooms are normally priced from 800 rupees per night, plus tax, for a double. 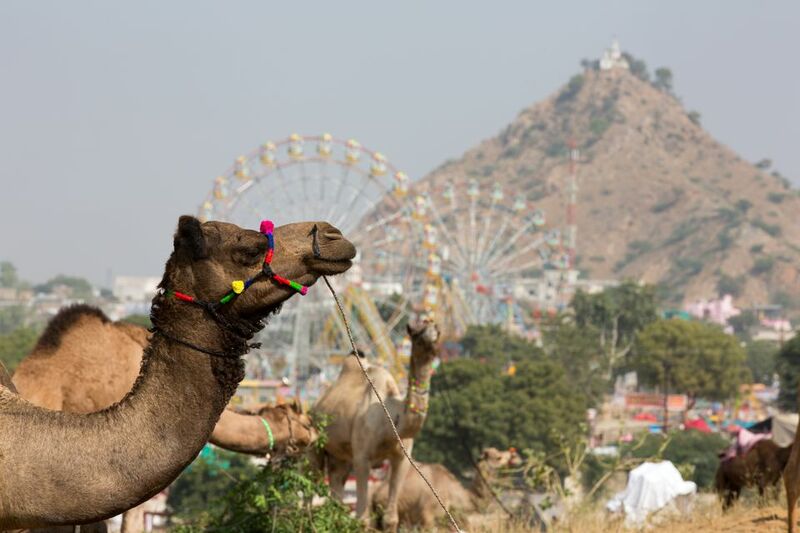 Expect to pay 4,300 rupees upwards per night for a double during the camel fair. Hotel Aroma is just a few minutes walk away from camel fairground. There are 12 rooms, all with TV, hot water and attached bathrooms. Some also have air conditioning. Plus, the hotel has a groovy rooftop restaurant that overlooks the street. Normal room rates start from around 800 rupees per night, plus tax, but jump to 4,250 rupees per night during the fair. Hotel Mama Luna is a basic budget hotel located close to the lake and around 5 minutes walk from the camel fairground. It has 14 rooms, groovy common area to chill out in, free wireless Internet, and a leafy rooftop restaurant. Expect to pay 2,200 rupees, plus tax, upwards per night during the camel fair. (Normal rates start from 450 rupees per night). Characterful Hotel Paramount Palace is situated in the same area as Hotel Mama Luna but its rates are a bit cheaper. However, it has everything you'd want in a budget hotel, plus magnificent views from the rooftop restaurant and some rooms. The best rooms have their own balconies. Most importantly, the staff are very helpful and genuine. Rates start from 1,500 rupees per night, plus tax, during the camel fair. Moustache Hostel, one of India's top backpacker hostel chains, has just opened up in Pushkar with a convenient location right by the lake and main market. It's about 10 minutes walk to the fairground. The hostel has private double rooms for about 1,000 rupees per night, plus tax, making it very budget-friendly. Alternatively, if you don't mind sleeping in a dorm, you can get a bed for only 350 rupees per night. Guests love the huge grassy courtyard in the middle of the hostel and common room. It's all about location, location at the RTDC Tourist Village. Being a government-run property, it has prime position right next to the fairground. The tourist village consists of permanent whitewashed huts and semi-permanent tents, all with private bathrooms, set around a large expanse of lawns. It's understandably popular, especially with tour groups, so make sure you book well in advance. Don't expect great service though. Reservations can be made through the RTDC website. Rates are priced from 3,000-3,500 rupees per night for a double, including breakfast and lunch or dinner. (Normal rates are 1,100-1,300 rupees per night for a double, including breakfast).